Whenever I hear Frank Sinatra singing “Fly me to the Moon”, it reminds me of the Mt John Observatory Stargazing Tour at Lake Tekapo. 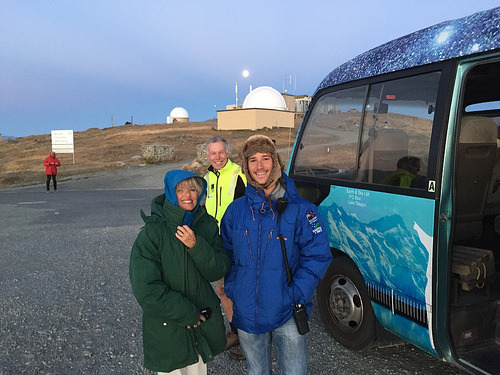 We chose the Twilight tour and rugged up well for the cold. However our guide insisted on us wearing their huge Arctic quilted jackets. We quickly discovered why. 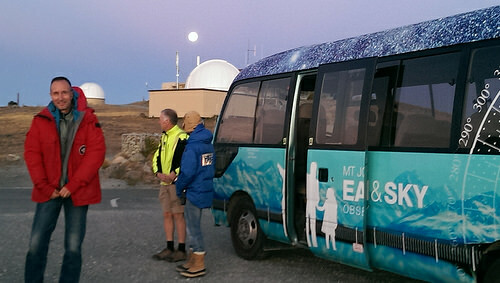 Visitors are collected in a mini bus for a 15 min drive up to the observatory. Although the driver provides a commentary, you will be distracted by the beautiful surrounding arid landscape surrounding us. Moisture in the atmosphere tends to scatter the light thus making the dry McKenzie Basin a perfect location for stargazing. There’s also a wonderful sense of quiet and serenity here. It is terribly cold though, so you’ll love that arctic jacket! Here’s me with our driver and one of the guides, the very photogenic Byron, who coped well with the cold. The same could also be said of the driver standing behind Michael. Respect to the man’s choice of beach shorts. White light interferes with telescopic clarity so it is banned from this tour. Leave your torches behind people. The good news is that you will be provided with a mini red solar-powered light to see your way. 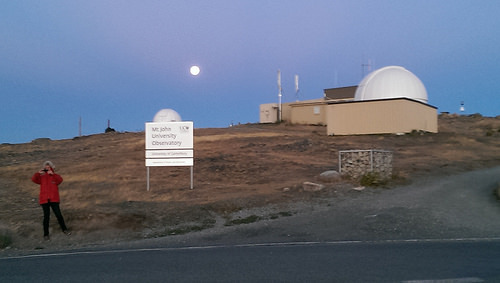 Up here at the Mt John Observatory, Astronomers are the coolest guys in town. They’re passionate about Astronomy and have a great sense of humour. Their day typically starts at 4pm and goes through to 9am in the morning. In winter, we’re told it’s magical. Just one lens from this telescope cost 1 million dollars! Visitors are taken to the actual control room where you’ll probably meet Paul, Paul, the Astronomer. The guides refer to him as”Paul-the-Astronomer”. “Paul-the-Astronomer” was a giant of a man with luxurious long brown hair. He loomed out of the darkness wearing a beanie and leather boots. In fact, he wore a more than passing resemblance to a young Ozzy Osbourne. And yes, he is very cool! Once in the cafe, we enjoyed an animated screen presentation showing how ancient civilizations identified the stars. 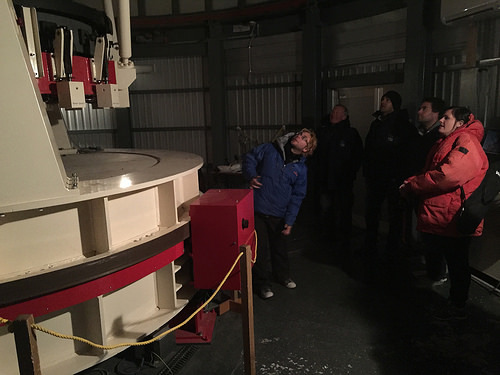 We learnt about the large clouds of Magellan, Globular clusters and the famous Jewel Box cluster. Looking around at these stars, trillions of light years away, its a surreal experience. After the cafe presentation, we gratefully accepted Hot chocolate and baked brownies. This helped to sustain us when we stepped outside for a second time – more stargazing through the telescopes. On the way back down the hill, the driver used his park lights only. This ensured the white light was kept to a minimum. Anticipating that some passengers may be nervous about this, we were calmed by the soothing music of ‘ole blue eyes’ singing “Fly me to the Moon” I thought that was a nice touch. And every time I hear that song, it will remind me of the coolest dudes in town at the Mt John Observatory Stargazing Tour. That sounds like a really cool trip – in all senses of the word! Was that driver in shorts in the background? A true Southern Man. You were so lucky to have such a clear night. Add to that photogenic guides and groovy astronomer dudes and, all in all, sounds like a terrific night. Hey Jane, yes, that was the driver in shorts. The southern man in the red jacket was keener on putting on more layers. The scenery alone on this trip is worth the cost. However you can go up to Mt John during the day. I think the gates close at 6pm when the tours start. ok so now I’m going to have Frank singing to me all day – not that I mind as I love him! 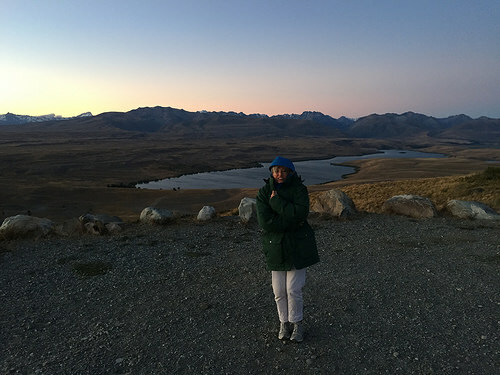 Also love star gazing and the Mt John Observatory is on my list of things to do so great to get your blog. The guides sound wonderful – nothing better than guides who are enthusiast about what they are promoting. Sounds like a wonderful trip and can’t wait to go myself. …and it wasn’t only Frank. There was also David Bowie singing about “Major Tom”. Wish I could have stayed longer here, the night atmosphere was very special.